Musgrave is a contemporary abstract painter based in Melbourne, Australia. His contribution to this form is a unique sense of soulfulness, offering a subtle, ethereal expression to that which is deeply passionate and instinctual. 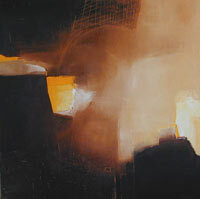 Stepping into a gallery space of Andrew Musgrave's paintings is like walking through a gateway to invisible landscapes. The viewer is invited to turn away from outer concerns and to allow their own imagination to be stirred. His work appeals to deep things within the self that can't quite be put into words. It's a bit like the moment of waking up from a dream, where story, people and places have slipped from our grasp into the mists. We can never see just what it is, yet we feel something strangely stirred inside. When this artist describes the creative process, one is reminded of the medieval alchemists' journey to know the Mystery of the universe. Musgrave places much importance on the preparation time before the paint goes onto the canvas. Just as the alchemists worked to transform raw materials into gold, he mixes and blends the various colours of paint together with solid mediums in a meditational mindfulness. Placing himself in the precarious position of being open to the unconscious, Musgrave describes the transference of energy, into a visceral response, bringing the energy down deep into his gut. As much a transformation within his own psyche, he works internally to allow the chaos, trusting the process will bring something new into being. It is at that point that a real freedom comes about. Often the initial form comes out of the gut, where its rawness is transformed. It is at that moment when the artist feels the deepest connection, an at-one-ment with the canvas and a sense of blissful knowing of "the other". The results on canvas express an artist with a penetrating philosophical mind informed at all times by personal experience. Musgrave is interested in paradox and working with a constant tension of opposites. 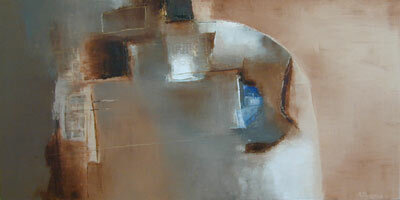 Visually his work implies form emerging, hence image is very subtle. Form emerges organically to find its own place on the canvas. Similarly, line, texture, light and shade jostle to find their own balance, as in nature. After integrating the complexity of roughness and softness, spacious openness and closure, merger and definition, the work emerges with a simplicity, truth and beauty. Musgrave has done all the hard and perilous work for the viewer. We are transported beyond ordinary place and time to a subterranean river that connects us all. The work of unification between spirit and soul is delightfully and aesthetically represented on the canvases touching that which is mystic for those courageous enough to surrender to it. Thanks to Musgrave's gift, we can embark and return on an odyssey to intangible realities, within the safety of our own skins. Leoni Phelan - September 2005, Freelance Writer. The above text is based on interviews with the artist. 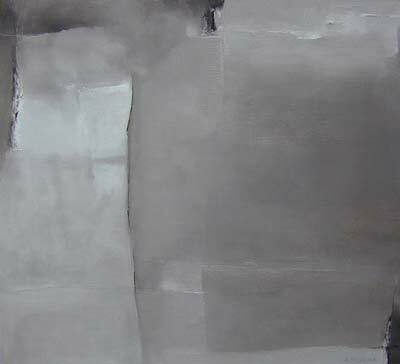 A contemporary abstract painter based in Melbourne, Australia; Musgrave's work may be described as abstract expressionism but with a soul. His paintings, oil on canvas, are extremely passionate and highly textured and evoke the imagination. Through his artwork Andrew has come to know the 'sacred', not in the conventional religious sense but rather as a 'mystery' and presence that permeates the core of everyday life. It challenges the traditional model of God as an object or supernatural being that exists outside of our selves. Rather it denotes a new understanding of God that is outside our rational thought but which is revealed to those who care to take the time to close their eyes, look within and feel deeply enough. His paintings attempt to capture something of the mystery of the spirit and give it form. They are expressions or statements of his encounter with the sacred, which demand an intense and intimate connection to his own inner experiences. This work of bringing to birth a new understanding of God is of vital importance in a time when, for many, our faith and experience is no longer contained in traditional religious models and dogma.